Former Grierson DocLab trainee, Ryan Gregory, has won the inaugural BBC Three Northern Docs Pitch at this year's Sheffield Doc/Fest. The Grierson Trust’s DocLab Training and Mentoring Scheme, run in partnership with Bertha DocHouse, prepares new entrants to the industry with the skills to make them ‘job ready’. Ryan was one of six directors invited to pitch as part of the BBC's mission to start new collaborations with talented filmmakers based in the north of England who are yet to direct a long-form film for broadcast. As winner of the pitch, Ryan will be offered a commission to make a 60 minute film for the BBC plus mentoring and production support from Blakeway North. Ryan, based in Leigh, Lancashire, says: 'Ever since I was told I received the commission I've been going through a weird rollercoaster of emotions. The Grierson DocLab helped immensely in so many different ways. Firstly I wouldn't even have known about Sheffield Doc/Fest if it wasn't for the DocLab! "Doing a mock pitch with the same idea this time last year allowed me to practice and hone my pitch. Then there's the support and advice from people with much more experience when I was practising my pitch in days leading up to the live event. 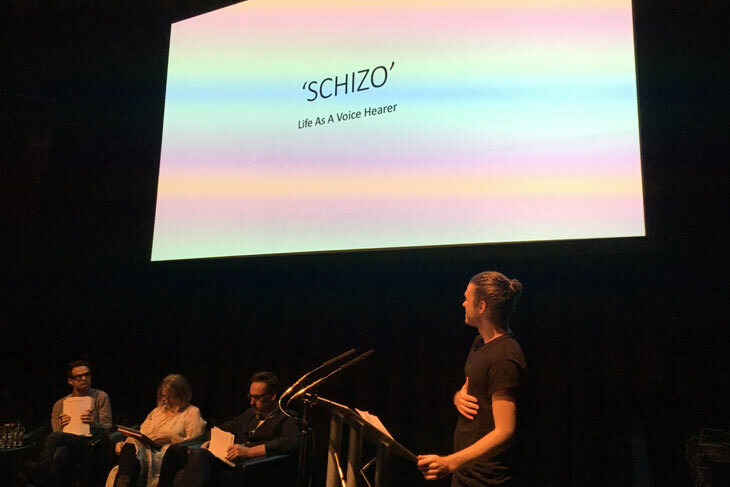 "The film focuses on two voice hearers - what is commonly referred to as suffering from schizophrenia - and through the use of voice actors we will reconstruct the voices that our subjects hear. I'm both nervous and excited to start working on the project as this is the biggest creative project I've led and I can't wait to start work with Blakeway North." The panel which had the difficult task of judging the pitches was made up of commissioners and industry representatives - hosted by Danny Horan, the BBC's Documentary Commissioning Editor for BBC Three. It took place in front of a live audience during Sheffield Doc/Fest. Danny Horan says: "I am delighted Ryan won the live pitch for our new scheme. He’s an extraordinary new talent and we feel privileged to be working with him, especially because the quality of ideas and young new directors was so high. Ryan will be working with Blakeway North to develop his idea and be mentored closely by the Docs team. There is real talent in the North of England we are keen to work more with and Ryan represents a new breed of director we are excited to be making films with." Jane Callaghan, Managing Director of The Grierson Trust said: "This was the highlight of Sheffield! I'm so delighted for Ryan. He did a fantastic pitch and was very impressive in answering the panel's supplementary questioning. Meanwhile, The Grierson DocLab continues to go from strength to strength as we work with independent production companies to provide the best possible training for the industry's brightest and best aspiring filmmakers." DocLab also offers financial support for trainees, bursaries for work placements and a dynamic programme of workshops, masterclasses and mentoring, giving the 18 – 25 year olds an important opportunity to gain their first foothold in the documentary industry. The popular scheme has been running for four years with the support of the UK's leading independent factual production companies. Blast! Films, Century Films, Dragonfly, Lightbox, Lion TV, Minnow Films, Popkorn, Pulse, Raw, Renegade Pictures, Testimony Films, The Garden, True North, True Vision, Voltage TV and Wall to Wall have all committed their assistance for 2017, with additional support from Blueberry Creative. Are you a robot? 10 - 3 = ?